Digital imaging opens up a wide range of fun things to do with your photographs. For instance, with Akvis Sketch (various pricing, 10-day free trial), you don't need any drawing or painting skills to turn your photos into charcoal, watercolor, pastel, or pencil sketches. Akvis Sketch converts photos into digital images that emulate pencil sketches, watercolor, charcoal and/or pastel drawings, with automatic or comparatively easy to use tools, and immediate feedback. Akvis Sketch is available as either a standalone program or a plug-in works within Photoshop-type programs. The interface is very straightforward and easy to understand. The Help menu is direct with adequate guidance, though little in terms of creative suggestions. When you open a photo, Akvis Sketch places a square preview section over the picture, with the default settings for a black and white pencil sketch. You can enlarge that preview box, or click on the After tab, to view the effect on the entire image. Options are not extensive, but they do provide a nice variety of creative possibilities. Presets include Sketch Light, Sketch, Watercolor, Watercolor Bright, Charcoal Low, Charcoal High, Color Pencil Low, Color Pencil High, and Pastel. 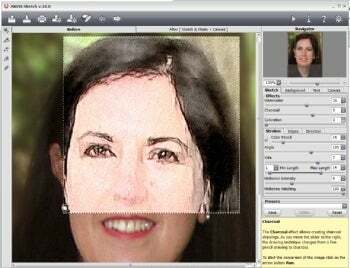 Using the slider controls you can increase or decrease effects, combine styles, change the angle or size of brush strokes, and adjust the midtone intensity and hatching. You can also choose whether or not to keep the photo in the background, and if so, if it should be blurred. In addition, you can add text and apply a canvas texture. The one option that doesn't work as well as the others is applying the art effects to only a portion of picture, retaining the photo for the rest of the picture. This is because you will need to use a freehand selection tool, which requires careful hand-eye coordination and some drawing skill to use. Akvis Sketch is a generally simple-to-use program, and its immediate feedback can make work go quickly. With it, you can create some nice drawing effects out of your photos. Note: This program is available in different licenses. The price for a home-use license for either the plug-in or the standalone version is $72. The price for home users who want both the plug-in and the standalone versions is $89. For a business license (for commercial institutes) the price for the plug-in and standalone is $154.